The Secret World goes subscription-free!! As 12/12/12 12:12 hit (though an hour early, as they were going on Norway time) a bombshell hit. 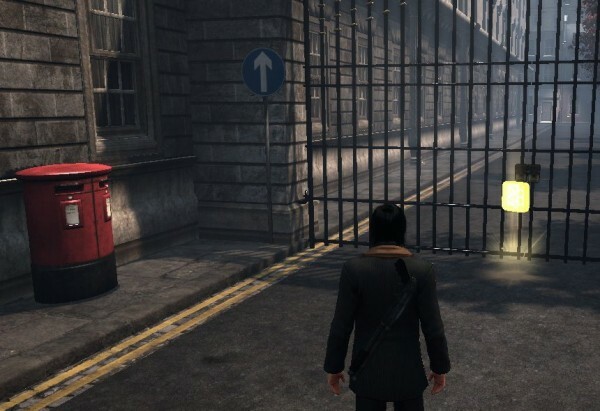 The Secret World, inspired no doubt by the success of Guild Wars 2, is going subscription free. Like GW2 you still need to buy the game, but beyond that, you can play without further costs if you so choose. But is it safe? Of course it’s perfectly safe. No one’s entirely sure how it works. I don’t like to contradict anyone in a hat as splendid as the Stationmaster’s, but we do have a fair idea of how it’ll work. It’s a pretty generous deal by the looks of things. You get the full game without limitations, with none of the punitive nonsense you get in some F2P games (Looking at YOU, SWTOR). Going forward, we’ll be paying for content DLC, or what we used to call “game updates”, though some of those will still be core to the game and free to all users. The Grandmaster pack includes all these benefits and gets an additional 10% discount to everything in the in-game store, for a total bonus of 20%. So being a Grandmaster is better than ever! Through the month of December we have a special offer where we give 30% off on the first purchase on the 3, 6 and 12 month Membership plans. Not everyone will have the choice of course. Some people paid $250 for a lifetime Grandmaster membership. It turns out that all they really got for that was the opportunity to lose the choice of whether to play for free or not. I’ve said it many times, and I’ll say it again. In these times where games go F2P or subless within a year of launch, Lifetime subs are a terrible idea. We shouldn’t buy them, and companies should not even be offering them. Lifetime subs are a gamble, and the odds on it paying off are getting longer every year. Anyhows, for everyone who didn’t buy a life account, this change is a 100% positive no-grumbles thing. At least it is so long as it attracts enough new players to compensate for all of the folks, myself included, who will now cancel our subscriptions, and simply buy the updates when they come along. That sounds like that’ll work out a lot cheaper, and will free my limited gaming funds for keeping an eye on an extra MMO. There’s an official FAQ on all this over here. For me, the decision to get a lifetime sub is based on whether or not I think that’ll get me most value for money. So it’s always bizarre, when an MMO suddenly goes F2P, to hear all the folks saying they go lifetimer as a form of charity, so they don’t mind. I only wish I could afford to be so charitable. My buying decisions have to be based on personal economics. And it’s becoming increasingly obvious that lifetimes are a bad deal. If you care about getting a bad deal. You might not, it seems. Yes, lifers now get $10 of shop credit a month, but shop items are not what lifers thought they were buying when they signed up. If some lifetimers like what the bait has been switched for, that’s great, but that does not mean that all lifers are obliged to be happy about it, or that we shouldn’t point out what is a fairly shady move. I suspect it’s partially due to a peculiar psychological affect. Humans tend to value money less once they’ve spent it. You shrug your shoulders and move on, and that is certainly very healthy for the temper, but it is not a good way of encouraging companies to play fair with us. For me, it’s very clear. I have $150 more than I would have done if I’d gotten a lifetime account, which I can use for other goods and services. At the very least, customers deserve to be told, at the time of purchase, what their lifetime subscription would be turned into in the event of the game becoming subscriptionless. Surely we can agree on that? I’ve been in the Beseiged Farmlands of Transylvania for a couple of days now. It’s pretty heavy going. While it’s sometimes tricky to figure out how tough things are, everything here drops QL 10 gear, which is the highest QL I’m aware of. There’s still two more Transylvanian areas after this one, and I assume they’re tougher still, so I’m not sure what sort of gear will be found there. Perhaps blue and purple gear becomes more common out that way. As I discovered yesterday, being decked out in QL 9 and 10 gear does not render you as invincible on Solomon Island as you might think, and I still managed to get myself killed in the Blue Mountains when I swept back to finish off a mission I’d found too much for me previously. (By Jove, do I HATE Mud Golems!) While QL 10 certainly makes you tougher, it is far from the exponential increase in power that you would see in a level-based MMO. That’s a good thing, as it means that the lower tier zones can still be interesting, at least from a challenge perspective, though the gear you might find there on your return would be destined only for recycling. Transylvania is largely as you would expect. Vampires to the left of you, werewolves to the right, and it hardly ever stops raining, a lot like the weather in Norwich at the moment. It makes me rather miss Egypt. The place might be infested with cultists, but at least it was usually sunny during the day. When everything all seems a bit bleak and grey, I like to visit my new friend Cucuvea. Certain parts of Transylvania make you feel like you just stepped into Greater Faydark, Silverwood, or Teldrassil, and Cucuvea’s home is a lovely warm place for any adventurer who needs to get out of the rain. Also, she has free wireless. Cucuvea’s home inside a Transylvanian Tree in The Secret World. There was a state of the game letter yesterday, and I was excited to learn that Funcom are planning monthly updates as part of our subscription. 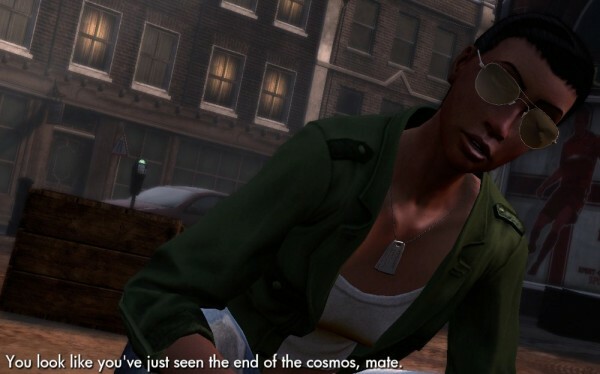 The first will be on the 31st of July, and will mostly involve adding more investigation missions throughout the zones. This, as you might expect, makes me very happy. It’s entirely likely that the first few updates are just launch content that wasn’t finished in time, but that’s OK. If they keep to their monthly intentions, it just might inspire me to stay subscribed full-time. As time passes by, there is one thing I’d love to see updated eventually. Egypt and Transylvania are both quite heavy with ghouls. While I understand that artist time is finite, the ghūl of Arabia, and the vampire-related ghouls of the Carpathians are drawn from somewhat different mythologies, and I think would be good for them to be two different sorts of creature within The Secret World, for the sake of variety as much as anything else. The same goes for the return of scarecrows in Transylvania. They should look different to Henderson’s creations on Solomon Island. Perhaps some “thin-style” scarecrows, if scarecrows there must be. 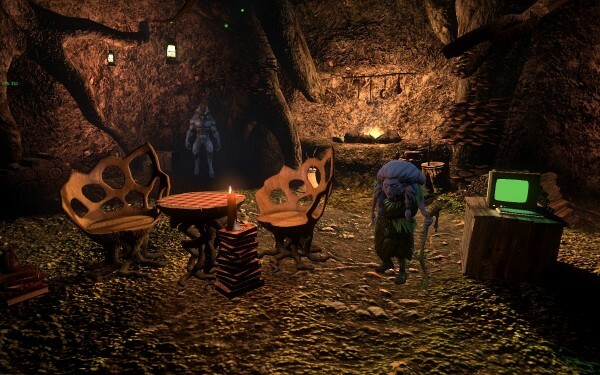 Of course it is inevitable that models and monsters are going to be re-used in different zones in MMOs, but those are the two cases that just feel a little odd to me, especially if you’re trying to evoke the feeling of different places and cultures. The Secret World went into head-start a little over a week ago now, and I have been deep into my investigations of all that is strange and spooky. I absolutely adore investigation missions, and I wish there were more of them. I am very proud that I have so far managed to solve them all myself, and they are, alongside the story, what makes Secret World so compelling for me. I am aware, though, that there is a finite number of them, and they will have minimal replay value (also, they’re some of the few missions that you can’t replay on the same character), unless I somehow manage to forget the solutions. In a classless game there does not feel like too much purpose in creating an alt, and I doubt I will, as the differences in playthrough experience between factions are slight. In any case, I love being a Templar! As ever, I’m a bit of a questing completist, and I’ve done every mission I can find on the way here, apart from a small number in which I get eviscerated. I will pop back and deal with them, eventually. For now, I’m just glad to get away from New England to somewhere sunnier and less filled with zombies and draug. Maybe I’ll find the final lore items that continue to elude me in the lower tier zones. 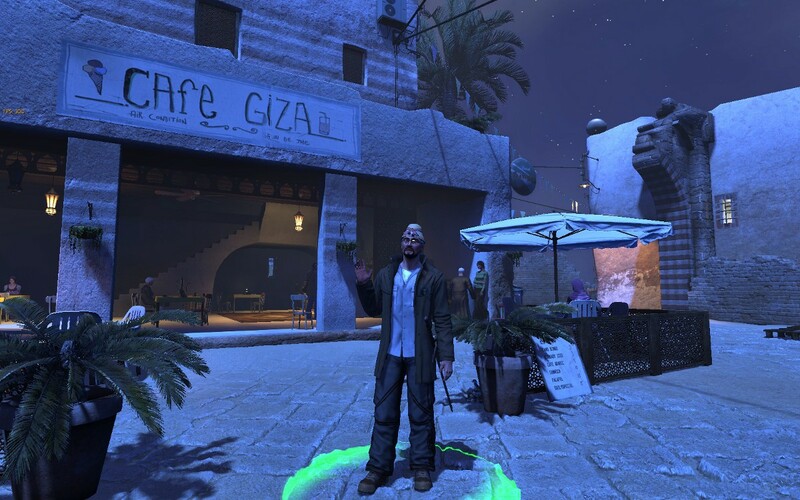 From what I know about the number of zones in the game, it would seem I’m just over halfway through, as I just arrived in the City of the Sun, the second Egyptian zone. I’ve not done much with PVP or the group dungeons yet, other than one jaunt into Polaris with a few twitter friends. It looks to me that none of the group content will not be soloable regardless of how powerful I get, so I shall have to bite the bullet and potter along on further excursions. I may even end up enjoying it! Looking like a complete tourist in al-Merayah. I can see many of the issues that SWTOR had coming to haunt TSW too. The stories and content are fantastic, but I am not sure there is sufficient quantity for the long-term, though that depends on how quickly you devour it, and your tolerance for repeating missions. Be that as it may, I can definitely recommend coming along for a visit, as what there is is quite excellent. Continuing on from part 7! In our last thrilling episode, our hero had finally made his way to Kingsmouth, via the most curious of travel arrangements, and battled his way through a slight zombie outbreak to the Sheriff’s office. I first make my way onto the roof of the building, where deputies are keeping the zombies at bay with well-times rifle-shots. Deputy Andy is up here, and I deliver the ammo that I found on the way here. When you finish a mission, you get the option to call in to base. There’s no need to go back to the original mission-giver, from what I’ve seen. I’m not sure how Mr Sonnac manages to send me material rewards via my phone, but I’m not going to break that spell by disbelieving it! Deputy Andy has an action mission, but I figure I ought to check out what’s going on inside the office before I decide what tasks to take next. The first folks I meet in the office are a couple of rather oddly dressed vendors. Their uniform is vaguely military, with gray suits, but rather odd blue berets. Are they working for the United Nations, maybe? Two of them are selling basic equipment, one is selling kits for making consumables, and one has some truly awesome blue gear that you need to buy using Sequins of Solomon Island. Those are a sort of reward currency you get for completing missions around here. I have 3 so far, and the vendor wants 75, so we shall not be doing business just yet. 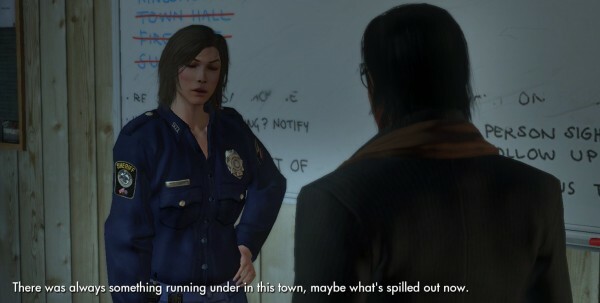 I can see a few item missions lying around, but first I want to talk to the person in charge, Sheriff Helen Bannerman. She’s pleased to see me, I think. Though I think she’d be pleased to see anyone with a gun right now. They’ve got evil fog, a zombie outbreak, weird ravens everywhere, and something going on in the pumpkin patch that she does not even want to know about. I figure the best thing for me to do first is help Deputy Andy ensure the security of this safe haven. If this falls, everything else is going to become a whole lot trickier to deal with. So, Elm Street Blues: a 5 part action mission. First up, I need to deal with some of the zombies outside. After that, I am sent to the northern barricade. As I get there, an event begins, and I’m joined by a couple of police officers. It’s just as well, as we are quickly assaulted by several waves of zombies. We do the same at the southern barricade, zombie bits flying all over, as we valiantly defend the wall. Part 4 wants me to investigate the source of the zombie attacks, right down the other end of Elm Street. Hmm, that sounds a bit on the dangerous side, so maybe I should see what other missions I can pick up that I might be able to work on while I’d over that way. None of the item missions in the office seem to be down Elm Street, but I pick them up anyway. While I’m in there, I notice that Sheriff Bannerman’s computer is usable. It’s an ancient piece of junk, with glowing green text on black, but I am allowed to access the suspect database. I have a rummage through, but nothing leaps out at me as being of immediate interest. I’ve seen some folks quite annoyed that the Kingsmouth map uses Comic Sans, but they rather missed the point. 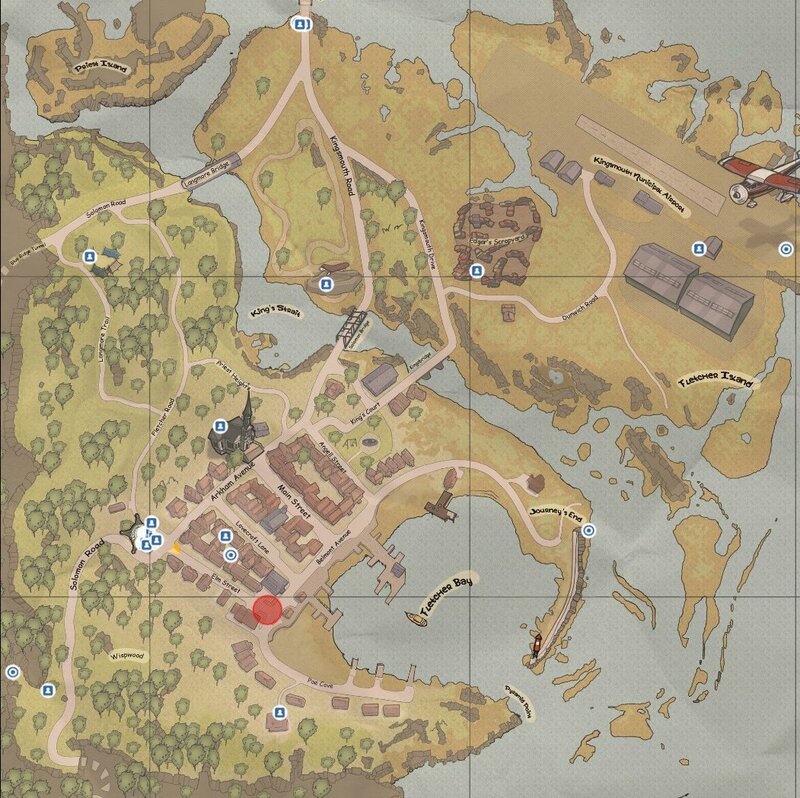 The maps, just like everything else, are supposed to be actual items from the area, and this one does a good job of evoking the local atmosphere. I’m the little yellow arrow, and my goal does not look terribly far on the map, but I can assure you that it feels much further when you have to run a gauntlet of zombies. I make it through a few more waves of zombies. Aha, I think I may have found the problem right here. A Draug Warmonger. No, I have no idea what that is either. Dealing with that rather nasty fellow brings an end to the mission. 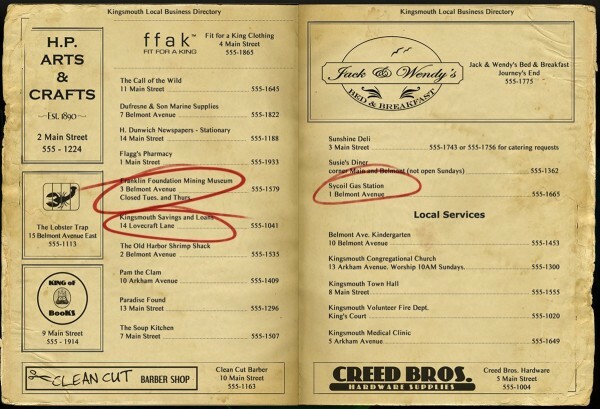 While checking the details in my mission log, I notice that Elm Street Blues is repeatable on a 24 hour timer. That’s handy, though might make it trickier for me to keep track of everything I’ve done. Hopefully they’ll mark it somehow on the mission giver. The end of Elm Street looks out over the beach, and I realise that the zombies are just a side-effect. They’re presumably being summoned as cannon-fodder by all the sea monsters that are rampaging around. I spend some time running around town doing action and item missions. I won’t trouble you with the details, as I’m sure we both want me to get to something I’ve done done yet, but I’ve gotten well past my 100 zombies slain achievement! 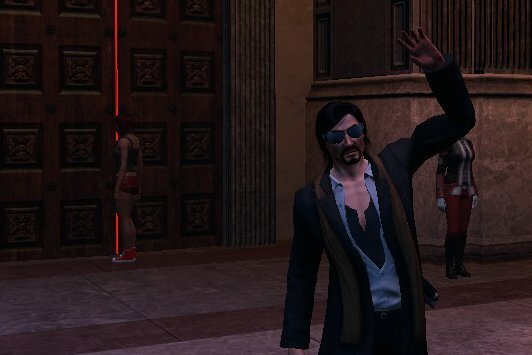 So, after getting the Sheriff’s supply run action mission done, I’m able to attempt a Sabotage mission, “Horror Show”. Sheriff Bannerman has decided it might be a good idea to hook up some surveilance equipment, so as to get a bit of advanced warning as to when the next zombie assault is going to begin. She needs me to go grab some of it for her, from businesses likely to have such things. I check the local phonebook. The Kingsmouth Phonebook worked better before the zombies ate the phonelines. Look at that! Back when I used to run Call of Cthulhu, I’d have been terribly pleased with myself if I’d come up with a prop or player handout like that. First up, I have to go grab the security camera from the gas station. Sabotage missions are supposed to involve some sneaking around, but it might be a while til we get to that. Taking the camera from the gas station, and then the bank is as simple as just grabbing them from the outside walls. The mining museum is a little more interesting. I’ve not visited here yet, and some of the displays look as if they might hold some clues. Oh wait, the camera is outside! Harrumph. I clamber up a ladder, but what is this? There is a note stuck to the camera, telling some unknown workman that this is the camera that needs changing. Wouldn’t it have been more sensible to leave the note downstairs? Well, at any rate, there are more cameras in…. the basement. If I’ve learned anything in my long dealings with the forces of darkness, it is that you should probably not go into the basement. Or the attic. I’m unhappy at this turn of events, but I head back inside to find the way down. Oh. The basement door is going to take me to an instance. This is the first example of instancing I’ve encountered in Kingsmouth so far. It does not bode well for me. The janitor, too, should have heeded my advice. He went into the cellar, and has gone all odd. He’s got the same head tentacles going on that the zombies I encountered in that strange Tokyo dream, but is still capable of speech. He uses that gift to tell me to go away. It appears he’s also capable of setting up a gauntlet of booby-traps to reinforce the message. This would be why it’s a sabotage mission then! Fortunately, he’s made the painfully common mistake of using extremely visible red lasers for his trip-wires. A little dexterous jumping should get me closer to him. In front of the total wall of red lasers is a door into another area. I don’t see any lasers in here, so I cautiously make my way in. What’s that beeping? And BOOM. My world explodes, and I suffer my first death of the game. Turns out that you really need to avoid any of the pools of light in there. Luckily I’m just back at the entrance to the basement. Now I know what I need to avoid, it’s not too tricky to make my way around the chamber, with a bit of jumping, to get to the switch which will hopefully turn the security lasers off. It has, but he’s retreated behind even more of the darn things! I shall not be defeated by a janitor armed with a thousand laser pointers and some dynamite! He has yet further ticks up his sleeve though, and in the next chamber, the pools of light (which turn out to be spotlights from the security cameras) are moving. This will require timing, which is not my strong suit. I think I’ve found a clever way around it for a moment, only to be blocked by an invisible wall. Curses!! But I persist, and find my way around. With his defences dealt with, the janitor springs at me, head-tentacles a-waving, but I put him down. Well, that was a slightly confusing business, and I can see some people hating sabotage missions if that was just an easy one, but I quite enjoyed the attempt at a different sort of MMO quest. Not only that, but I have been rewarded with a lore object at the back of the room. I thought I’d try one of the investigation missions that folks have been talking about. 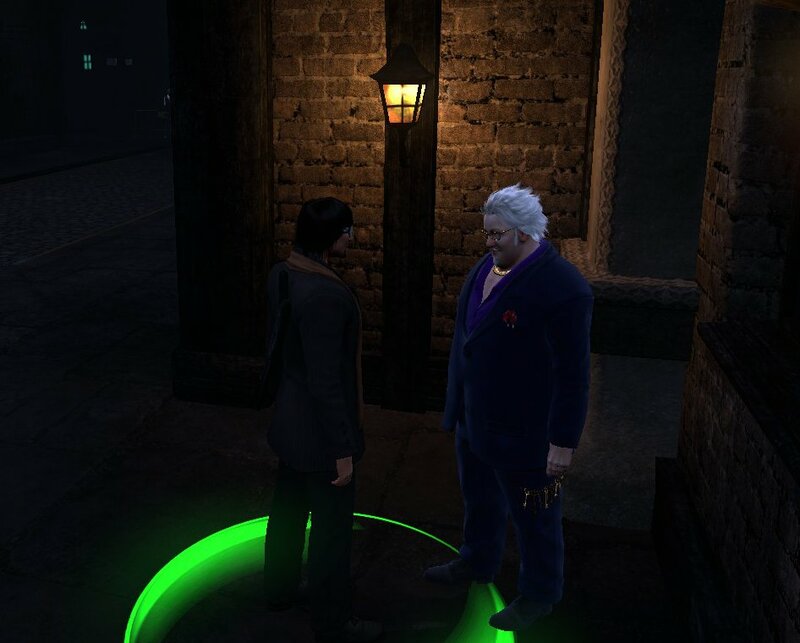 Rather than the Kingsmouth Code, which seems to be the main one, I gave “Something Wicked” a try. I don’t want to go into great detail, as the whole point of investigation missions is to solve puzzles, and pretty much anything I say could spoil it for someone. Something Wicked was wicked hard. At one point you have to do something so counter to everything you’ve ever learned in an MMO (or indeed in real life, come to think of it) that it did not occur to me, and I had to go seek help. I was rather annoyed with myself for giving in, and I’m going to do my darnedest to not do that again. You get precious little guidance, no map markers, and only the vaguest of clues. You will either find investigation missions to be incredibly engrossing, or utterly frustrating. Most likely both. I’m sure there’ll be well written guides for them all before terribly long, either way. I think I’d best draw my beta-run to a close. I don’t want to spoil things too much for myself when the game launches on the 19th of June. I’ll finish things off with a final post summing up my thoughts on the game, some time this week. Thanks to everyone who’s been hitting the refresh button to see how I’ve been getting on! If there’s something you wanted me to discuss that I didn’t get to, let me know, and I’ll add it in. 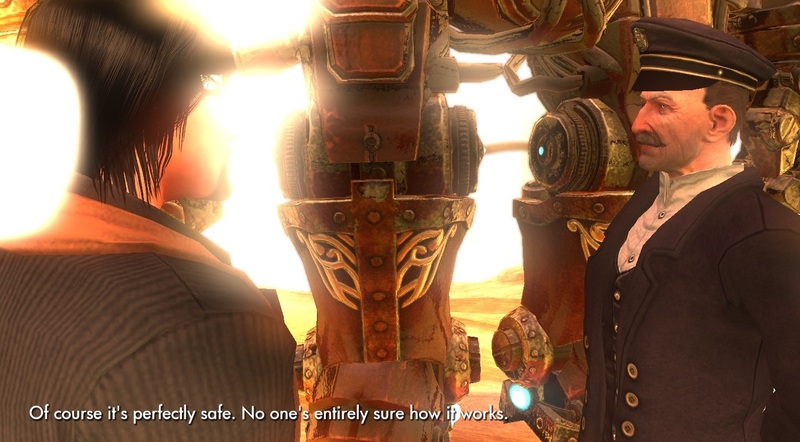 It’s another Secret World beta weekend, and I’ll be continuing on where I left off. Once again, Templar are the only playable faction, but some extra content has been unlocked in New England, though the chances of me reaching it, at the rate I do these things, is quite minimal. When we last saw our hero, he was trapped in the Crucible by a particularly unpleasant bug. I am happy to report that he was able to get back into the Temple without difficulty this time, though there are people still experiencing the problem on the forum. Also, I was still unable to choose blood magic as my initial skillset, but I am told I can access it once I get my hands on a focus for it. I celebrate successfully using a door without my clothes falling off. Stepping into the Temple, I head over to Richard Sonnac’s office, just across the hall. As usual, he gets straight to business. Forget that I’ve only been here for about 20 minutes, it’s off to America with me! Solomon Island is experiencing some sort of supernatural difficulties, and I’m to go investigate. Mysteriously, he tells me that the Stationmaster of Ealdwic undergound station will see to my travel arrangements. There is no time to lose! Oho!!! A mysterious glowing thing. I had best poke it with my finger. 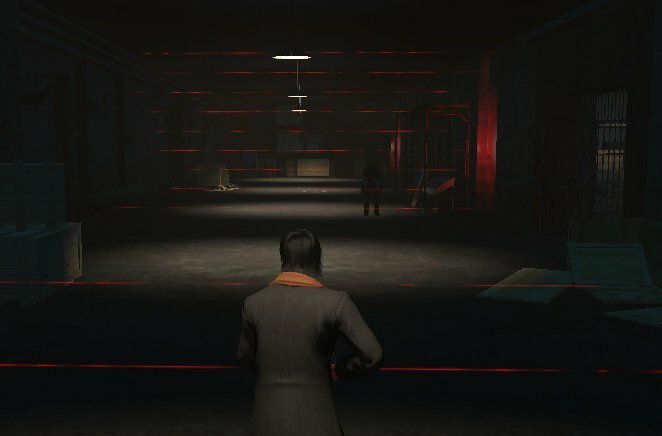 A Secret World Lore object. Rejoice, oh ye Explorer Bartle-types! That strange yellow glowy is a Lore object, filled with mysterious lore goodness. It looks like they come in sets to collect. The one I just found was in the Templar set. I wonder if I can find any more? My search for more lore takes my on an exploration of London. The Templar Club seems an interesting place, with a few conversable NPCs (which don’t all seem to be working quite right yet). I find no lore objects, though Mr Gladstone is happy to provide me with a great deal of knowledge, not to mention advice on the hallucinogenic properties of common household items. Moving onwards, I find Pangaea, a local clothes shop. I’m about to turn away when I realise that I have 10 million coins, presumably to assist in my beta testing. There’s a wide range of gear on offer, but I am unable to find any suitably academic-looking spectacles. There are a wide range of sunglasses, but they do not seem to be a particularly intelligent choice of eyewear, given how much time I am likely to be spending rooting around in dark places. And then, across from the park, I encounter a gentleman who has me seething with envy. Not only does this scoundrel have glasses with clear lenses, he is also the first person I have met that is not using the standard super-fit body shape. I am consumed with wrath and jealousy that he has taken such amazing gifts, and then chosen to wear such a horrible suit with it. His name is Mr Rosenbaum, and he is my nemesis. I’ve carried on exploring London, and just got my “Explore London” Achievement for visiting all the different areas. I’ve found 12 of the 15 Templar lore items, and I suspect the others are hiding here somewhere if I continue searching. Beyond the relatively pleasant area of Ealdwic lies Darkside, an altogether grimier place. Within it I found the entrance to the Fight Club, where you can reportedly engage in PvP with other folks in an arena-like manner. However, I’ve also heard that people going in there are having trouble getting out again, so I decided it might be better not to think about Fight Club for now. Or wait, no, it was not particularly devilish at all. I’ve just been playing too much Guild Wars, and have forgotten how to think in terms of jumping. I have encountered a large number of NPCs who feel like they ought to be selling things, but it may well be that I’m still considered to be in the tutorial, and those options have not yet been opened up to me. No matter. I have spent just enough time resisting the order to travel to Solomon Island that I feel sufficiently rebellious for now. To the Underground! As luck would have it, I find the final Templar lore piece in the tunnel down, getting me another achievement, and about a quarter of a level. Huzzah! That is the entrance to Agartha. There are bees, which makes me immediately mistrustful, but my orders are to step into it, so here we go. Good thing I’m not allergic. Oh oh. I’m not sure how to get this to work. I’ve stepped into it, run around in it, and clicked on everything that looks like it might do the job, but I’m still here. Maybe the server is having issues again. Oho! Persistence paid off, and away I go on a magical journey. Agartha, the hollow world! Apparently we Secret Worlders do not bother ourselves with such things as trains and aircraft. Why would we, when we can simply travel to the World Tree, and follow its branches to our destination, ignoring any of those bothersome details of space and time. Apparently, the lower branches of the tree connect to different places in time. I’d quite like to go back a couple of weeks and buy myself a mosquito net, but it’s too late for that, I fear. He's not been to the surface in a while. He is, by far, the most likeable person I have met so far. Perhaps because he doesn’t seem to be a member of any Secret Society. He’s got a job to do, he quite enjoys it, and he does it to the best of his capabilities. He was also refreshingly polite, compared with all the folks topside who have been competing as to which of them could be the edgiest. I wonder if he needs an assistant. I did always rather fancy becoming a traindriver. I stepped through the portal to Kingsmouth, and at that moment I think I finally arrived in the real game. Near my point of arrival was a mysterious fellow called Boone. If I judge him correctly, he dates back to the Old West, and he’s here to help. It's time for some grizzled wisdom with Boone! There’s a tabletop game called Deadlands. It’s basically Call of Cthulhu set in the Old West, and I played it with great glee for several years. So it is that I have a soft spot for any cowboy who fights the forces of darkness. Upon arrival, I received what I’m guessing is the overarching Story mission for the zone, which curently wants me to head to the Sheriff’s Office. Boone also has a task for me. He’s being pestered by zombies, and would like me to cut their numbers down, and maybe figure out where those pesky varmints are coming from. Boone’s task is an Action mission, “For a Fistful of Zombies”. The distinction is important, because you can only have one of any given type of mission on the go at a time. I’m not sure how that’ll work out in the long run, as I can imagine finding a mission and not being able to take it, and finding that a bit annoying. In addition to Story and Action, there are also Item (you can have three Item missions at a time), Investigation, Sabotage, Group/Dungeon, and PVP missions. Of those, I am particularly looking forward to investigation missions, which, I’m told, require a fair amount of puzzle solving. I will use all my willpower to not ruin it for myself by consulting spoilers. 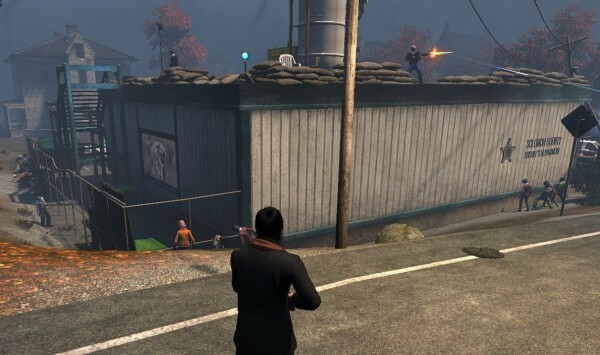 Sabotage missions are also called Stealth missions, and they also sound fun, with the emphasis being on sneaking around and not being noticed. For now though, I have an Action mission to take care of, which handily takes me in the direction of town and the Sheriff’s office anyway. Time to introduce my new shotgun to the joys of zombie-slaying. Eeek, these are not of the Slow Zombie persuasion. They pretend to be, right up until you get agro, then they move like greased lighting. It takes a few shots to take them down, but luckily they don’t dish out much damage, even though they tend to come in groups. Each mission has a number of what they call “Tiers”, or what everybody else calls “stages”. In “For a Fistful of Zombies”, there are several stages to get through. First you simply have to kill a few zombies, then you need to see if you can attract some more by setting car alarms off. Turns out you can. 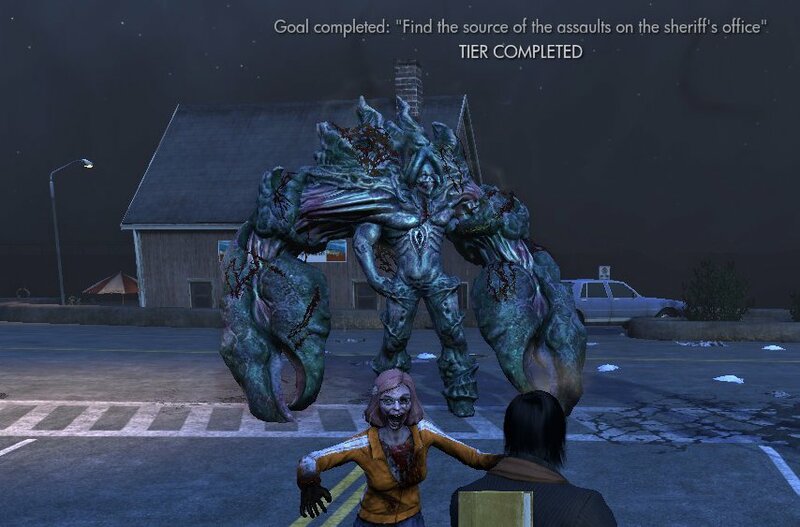 Zombies can generally be attracted by just about anything. This is all for the sake of science, so now we try setting some on fire with some discarded petrol cans. That works quite effectively too. Science is fun! As I dust the zombie ash from my jacket I notice a nearby corpse with a mission tag. It seems he was sent out to get more ammunition for the Sheriff’s office, but never quite made it. This is an Item mission, where I simply grab the ammunition case from the back of the nearby pickup truck, and will need to hand it in at the office, where I’m already headed. Some of these zombies have been dropping loot. Oddly, they’ve been carrying PAX, which is the strange currency used by us secret world types. I’ve upgraded my starting shotgun to a green-named one, and found a couple of other talismans and other weapons. Best of all, I found a blood magic focus. The blood magic option at the Crucible was broken, but I can now put some points into it if I feel like it, and I do. I take the Blood Shield spell in the Sacred line, which both heals and protects. Ugh, I was hoping the spell effect might look a little more sacred, and a little less blood. I may have chosen poorly, given my blood phobia. Picking a magic might be quite difficult for me. Elementalism feels a bit too fantasy wizard, and Chaos magic only seems appropriate for people who want to play Kung-Fu Sorcerer (which I certainly will, given how awesome that is, but not on this character). Blood magic is the nearest to the sort of Hermetic magic that would feel appropriate for a Templar, but it seems to be taking the blood side of it rather literally. After a little more zombie mayhem, I make it to the Sheriff’s office. They seem to be having some zombie issues of their own. It’s a good thing I brought that ammo. Now would be a bad time for me to do my world-famous zombie impersonation. 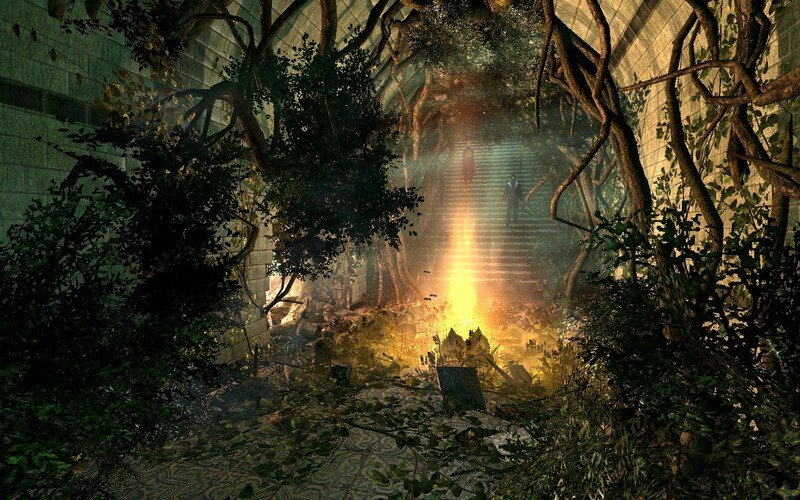 I quickly dash through the guarded entrance, and decide that I could do with some sleep. See you tomorrow for Part 8! Continuing on from Part 5, where I was last seen trying to decide which weapon skill I should pursue. I’m still dithering a bit. All the weapon skills seem quite decent, though something with a bit of range might prove to be most useful for me at this point. You can equip 2 weapons at once, so later on I’ll be able to have a close range and a long range weapon, but I can only have one for now. There is no time for such dallying, for the the beta ends today! I’m a big fan of having an AOE or two at my disposal, and not all sets have any in their starting skills, I’ll just go with what I know; my old friend, the shotgun. Mr Sonnac never turned up as promised, so I’d best head back to his office. Leaving the crucible will set your starting weapon, and its associated skill. There’s no going back now! Which is unfortunate, as things back in the main Temple have gone a bit odd. Oh dear. I don’t know what’s going on here, and I’m afraid to ask. Did some sort of pool party start while I was in the Crucible? Do we even have a pool? The Secret World Beta Bonanza Part 5 – Maybe it’s because I’m a Londoner. Continuing on from Part 4. I awaken back in London’s Ealdwic district. That crazy puppeteer is still chattering away on the stage, and I still have my wallet. I’m helped to my feet by a friendly fellow Templar. Actually, I think *everyone* in Ealdwic is a Templar, or at least related to them in some way or another. I realise, with a sudden sense of loss, that I no longer have my shotgun, nor any of the incredible powers that I so recently possessed. Of course, why on earth would I? It was just a foolish dream, perhaps brought on by stress, or the quarter-pound of mature cheddar that I consumed last night, and I’m sure it will have no bearing on anything going forward. Continue reading The Secret World Beta Bonanza Part 5 – Maybe it’s because I’m a Londoner.